What used to be a fashion faux pas is now fashion forward. One great way to pull off mixing metals successfully is to wear one piece that combines different metals. Here’s how our savviest shoppers have nailed this trend over the past week. One customer wearing a fabulous fur cape straight from her grandmother’s closet bought our handmade mixed metal bracelet as a gift, and I just had to get a photo of it on her as it was so perfect with her look. One of KTC’s newest pieces, this delicate handmade mixed metal martini bracelet has been a hot number since it hit the table last week. The combination of rose gold, silver, hematite and yellow gold makes it a classic with just a touch of edge. 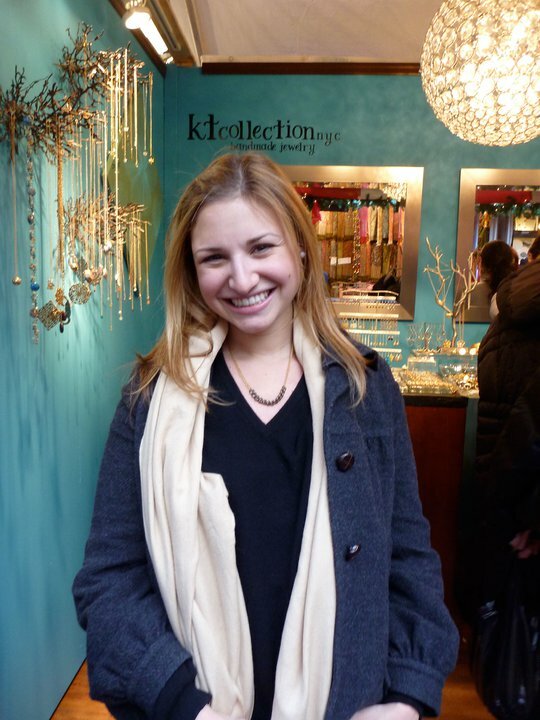 It is also the first time Katie is incorporating rose gold into her designs, and we at KTC love it. Look out for other designs with rose gold in the future. Want something with more bling? Try our mixed metal costume martini bracelet. Our handmade martini is not yet available online, but you can get one for yourself by emailing katie@ktcollection.com or stopping by one of our holiday market locations. Wear it alone as an elegant everyday piece or layer it for a more downtown chic vibe. Another KTC fan, Emily, spotted this vintage purse chain necklace made from a vintage steel purse chain and 14-kgold filled chain. (Also available in silver.) 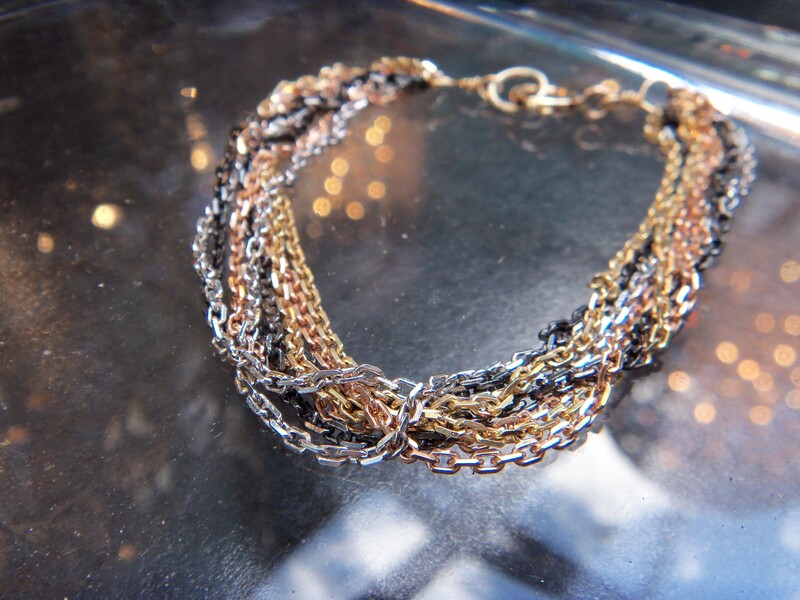 We love the way this piece not only mixes different metals, but also different textures. The delicate gold chain paired with the heavy steel chain is sure to make a statement. And why not try layering it with a long chain such as the multiple circle link chain? 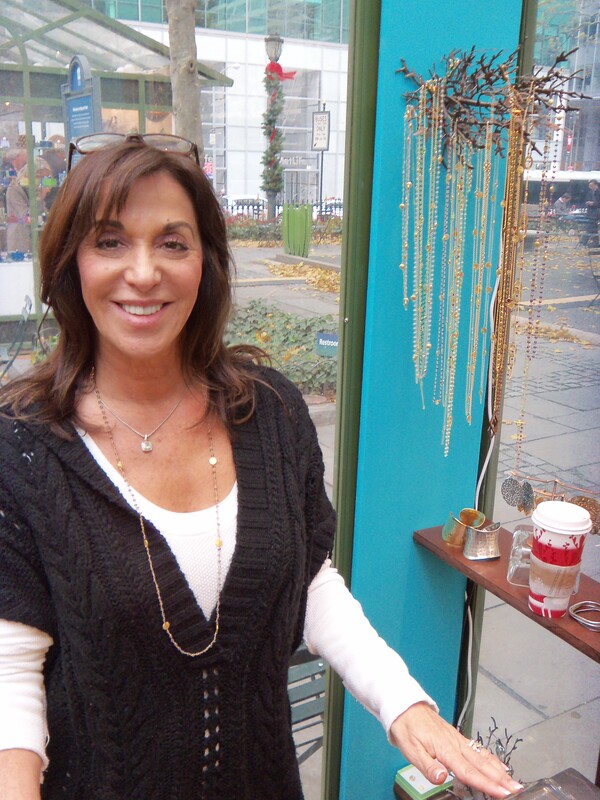 Barb came to our booth after spotting our semi-precious stone long necklaces while window-shopping at Bryant Park one evening. She was on the hunt to find a long necklace that would look good with a David Yurman piece that her husband had given her and that she wore daily. David Yurman mixes gold and silver well, so our challenge was to find a chain that would complement the look and feel of the piece but still add a little flair. These long chains are available in ruby, green or black onyx, cornelian, citrine, tourmaline, labradorite and tanzanite stones. We settled on the 36″ tanzanite chain with brushed vermeil discs. These long chains are available in ruby, green or black onyx, carnelian, citrine, tourmaline, labradorite and tanzanite. 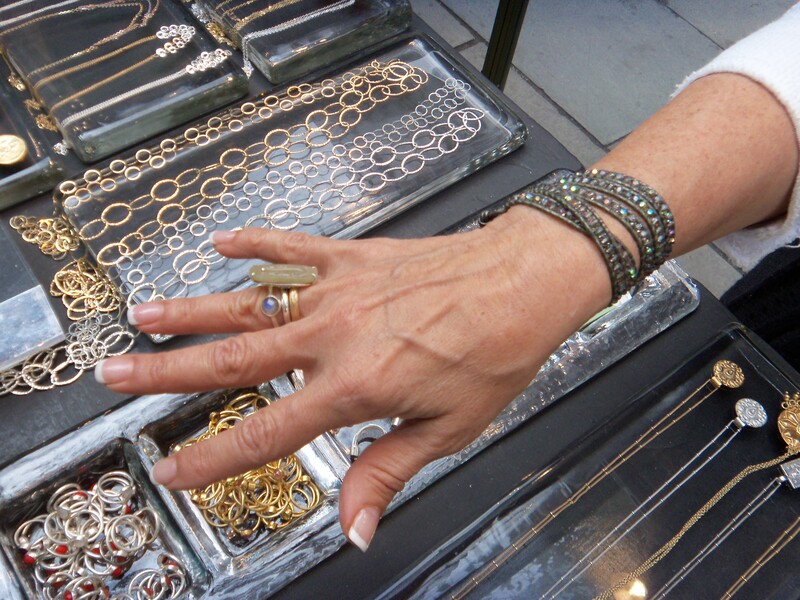 And just as Barb was on her way out, she spotted our semi-precious stone stacking rings. (These rings are not available online, but if you come by the holiday market they are 1 for $30 in silver and 3 for $75 or 1 for $40 in gold and 3 for $105.) Barb proved that there is no reason not to pair one with a larger ring. I was surprised how good this eclectic mix of jewelry styles looked. Just a reminder…there are no rules in how you wear your jewelry. Try things that may not seem to obviously go together, and you may just be surprised. I’m not a fan of gold, but paired with the gun metal and silver, it completes a perfect trio that I would definitely flaunt. And by the way, I love the new dragonfly sets!